When Barack Obama gives his sixth State of the Union address Tuesday night, it will be the first time he faces a Republican-controlled Congress. Many of the GOP newcomers believe they won because voters repudiated the president's policies. Republicans feel emboldened. The president will tell the new majority that for the first time in six years he can declare the economy on sound footing. His policies have been a success. He feels emboldened. "The economy is stronger, and he feels in a stronger political position as a result," says an Obama aide. There is always a political disconnect at the heart of the State of the Union--just watch a member of the opposing party fuss over whether to applaud--but the gap is wider this year. It's the difference between showing up to a fire with an extinguisher and showing up with grilling tongs. We know what the president will say because for the last few weeks he has traveled to Iowa, Michigan, and Arizona to lay out programs like items at a yard sale. He's promoting lower mortgage insurance rates, free community college, new consumer protections, a paid family-leave plan, and new financing for infrastructure projects. His biggest thematic thrust revolves around a tax swap: increased rates for the wealthy to pay for special targeted relief for the middle class. "I'm kind of in a rush," the president said last week in Cedar Falls, Iowa. "So I didn't want to wait until the State of the Union to share some of my ideas and some of my plans." The president is going to be aggressive, optimistic, and liberated in this new thrust, according to one White House aide who has seen the speech. Whereas in the past the president has promised that economic stability is around the corner, now he will declare that it has arrived. He will try to turn his claim of vindication for his past policies into political capital for a set of policies he says will allow the middle class to thrive. In the past the president has had to hedge any good news about the economy against the reality that the majority of the country didn't feel the progress. According to one Cabinet official, Tuesday night's speech will focus less on those left behind and more on those who have made it through the last few years because of their grit, pluck, and reliance on Obama administration policies. In keeping with that idea, the president has invited Americans who fit that description as guests. One woman was able to expand her small business through a Small Business Administration loan. Another is a veteran of Afghanistan who has returned home because of Obama's commitment to end combat there. Another is a student who received a loan with help from the Income-Based Repayment Plan and who has health insurance because of the Affordable Care Act. The public has been wisely resistant to claims that the economy has improved. Sure, some economic indicators are on the upswing, but chaos and a reversal of fortune are always around the corner. But heading into Tuesday night, there are some suggestions that actual optimism may be fluttering to stay alive. In a CBS poll last week, 53 percent rated the economy as "good." That's a 13-point jump since October and the first time a majority of the public has held that view since 2007, the start of the Great Recession. A recent Gallup poll found that Americans' assessment of their personal finances is as high as it has been since 2007. But public opinion is fickle, and the thaw has some way to go. In a new Washington Post poll, 41 percent see the economy in positive terms, compared with 27 percent who expressed that view in October. That may be heartening for the White House, but it means 60 percent still see the economy in negative terms. If middle-class voters don't see their lives reflected in the strong economic statistics--steady economic growth, 58 consecutive months of job gains, and a deficit that is a manageable percentage of GDP--the president hopes they will see themselves in the programs he is proposing. A White House aide says that when the president talks about his plans for a week of paid sick leave, tax breaks for two-earner couples, and expanding the child care tax credit, he will connect with people by showing he understands the specific challenges of their daily struggles. The president has suggested paying for these middle-class proposals by closing loopholes that benefit the wealthy and lowering the capital gains rate. An administration official affirms the political intent behind this Robin Hood approach: forcing Republicans who oppose the president's agenda to defend the wealthy at a time when a vast majority of the public already thinks the economic system is tilted in favor of the wealthy. "It's going to be pretty dangerous to support not closing the trust fund loophole to pay for community college," the official said. Republicans respond that the president is putting forward programs to raise his approval ratings that have no chance of passing and only seek to demonize Republicans. "If he is going to go to his corner, we're going to go to our corner," says an adviser to House GOP leadership characterizing the likely Republican response. If the president were really interested in reforming the tax code, as he says, he would be putting his political power behind that, say Republicans. Instead, by proposing new measures in the tax code that are complicated and costly, the president shows that he's not really serious about tax reform. That was one of the areas both sides say they want to work on together, but it's harder, say Republicans, if money you'd use to soften the blow of tax changes is being spent on the president's programs. The president likes to say that he is in the fourth quarter of his presidency, and in sports a lot of exciting things happen in the waning minutes. (Just ask the Packers.) It may be the first time a president has tried this transitive trick: By saying it will be exciting, perhaps he can make it so. Normally though, presidencies are not like sporting events. They are like Thanksgiving dinner: exciting at first, but by the time the drawn-out affair is over, everyone is tired and wants to take naps. 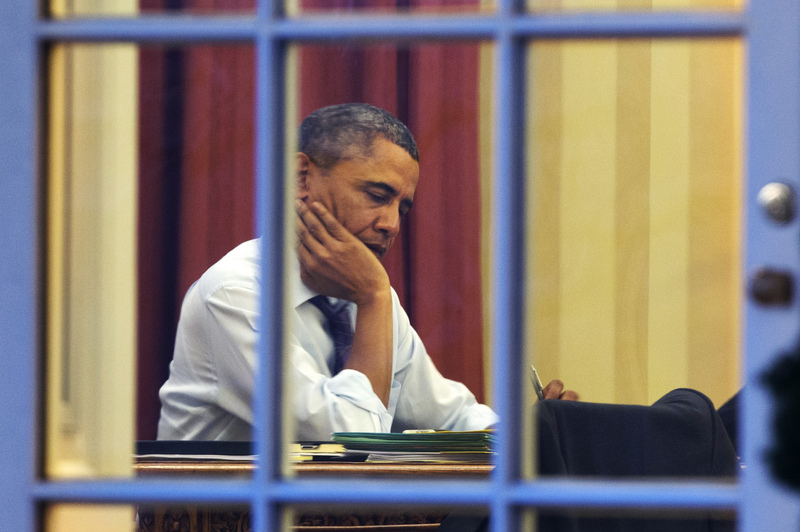 The State of the Union speech offers a window into Obama's challenge. It is full of conventions and restrictions. Like the lame duck designation, the State of the Union speech is hard to break out of its confinement. The president is trying, though, and although the biofeedback from his more skeptical audience Tuesday night might be the coldest of his presidency, he's not going to stop moving his wings.